The M.E.N. [Manchester Evening News] was alerted by a concerned member of staff, who said cockroaches had been a long-standing problem. The worker, who also claimed staff were told to keep quiet about the outbreak, said: “Customers have seen them. Staff have raised it lots of times but they have been told that they have to keep quiet. Staff have complained to managers but have been told not to say anything to the wider public. The cinema wouldn’t comment on claims that its staff were told to keep the outbreak under wraps. They said they are ‘confident’ the outbreak is fully under control and would be ‘resolved shortly’. Bosses said health and safety was of ‘utmost importance’. Manchester city council said it was informed by the cinema of a ‘low-level infestation’ last October. Cineworld Didsbury contains licensed bars, perfect as a breakout space for meetings or a drinks reception to round off the day. Our professional caterers can provide anything from pastries on arrival to a full hot buffet, and we can offer fantastic corporate deals on refreshments. UK: Cineworld hasn’t had the best of quarters, with profits dragged down by the merger with Picturehouse (more on that in the next item). Britain’s largest cinema operator Cineworld Group Plc <CINE.L> said full-year pretax profit fell 19.3 percent, hurt by transaction and reorganisation costs related to a recent acquisition and a regulatory probe. Cineworld said pretax profit fell to 30.9 million pounds ($51.7 million) in the year ended December 26, from 38.3 million pounds a year earlier. But today, Aberdeen City Council once again announced that the Belmont Cinema would be taken over by new bosses. Centre for the Moving Image (CMI) are the parent company of the Edinburgh-based Filmhouse cinema and will begin operating the Belmont from the start of next month. The move comes after Cineworld, who own the Picturehouse Cinemas group, were forced to sell one of their Aberdeen properties by the Competition Commission. UK: An independent cinema in Norfolk is abolishing its Monday promotion (GBP £3) and instead cutting the prices on all shows to just GBP £4. Film fans will soon be able to see the latest screenings at a reduced price – thanks to Lynn’s Majestic Cinema’s bid to support businesses by bringing crowds back to the town centre. Cutting the standard price of tickets by more than a third, the team are hoping to encourage more to venture into the town centre to watch the latest releases on the big screen. Manager Tom Cundy said: “We want to offer a price that is affordable to everyone, we think our prices are already good but now we want to encourage more people to come back to the town centre. Oman: A fascinating glimpse into what works in cinemas in Muscat, be it Hollywood or Bollywood, Blockbuster or Oscar winning art-house film. There’s not much in a way of a local film industry. So the box-office bottom line in Oman remains a Bollywood flick and only a Hollywood film with a Bollywood flavour or one that can lure the family crowd finds favour on the big screen. The rest are all consumed on the small screen, from DVD to watching on your computer screen. “This is the reason Bollywood movie Dhoom 3 was a blockbuster in Oman multiplexes,” he opined. A popular DVD lending library at Ruwi backs this view. Indian: Election-related multiplex bashing in South India has taken a break. Infor-mation Minister R Roshan Baig who took a dig at multiplexes for charging exorbitant rates in January has softened his stand after reviewing a report submitted by the multiplexes. UK: London will get its own drive-in cinema this summer at Alexandra Palace (AllyPally) and they will show – you guessed it – Grease. Twice. From 31 March to 11 April, the clever people behind Rooftop Cinema will transform the Pavilion Car Park at Alexandra Palace into a drive-in cinema, the only one in London. Complete with waiter service snack menu, it’s the ultimate lazy night out at the flicks. We’re sensing a vaguely automobile-esque theme, with films on show including Rush and Fast & Furious 6. If you’re not an action film fan, quell your inner romantic with About Time, or laugh it all off at Anchorman 2. UK: For those bored stiff of LVT’s Nymphomaniac, why not burlesque in front of the screen instead. On Saturday, a seductive shimmering selection of scantily clad darlings will be gracing the Westway Cinema stage as Lux De Ville presents An Evening Of Burlesque bringing a sumptuous slice of the Moulin Rouge to Frome. The Supreme Court on Wednesday held real estate barons Sushil and Gopal Ansal guilty in the 1997 Uphaar cinema tragedy that claimed the lives of 59 people and said they were more interested in making money than ensuring safety in their cinema halls. A two-judge Bench, however, disagreed over the quantum of punishment to be given to them and the issue has been referred to a three-judge Bench to pronounce a final verdict on it. USA: One of the leading digital cinema software and consulting companies will be showing off its new tools, not at CinemaCon but NAB. Imagine sitting on the beach sipping your favourite beverage while you marvel at Leonardo DiCaprio’s brilliant turn in The Wolf of Wall Street. Emaar Retail, a subsidiary of Dubai developer Emaar, has announced plans to open and manage a 10-screen Reel Cinemas complex at The Beach, a new mall being developed by Meraas Holding in Dubai Marina. The agreement follows the announcement of a recent joint venture by Emaar Properties and Meraas Holding to develop Dubai Hills Estate, the first phase of the Mohammed Bin Rashid City (MBR City). USA: It is not just in Europe where cinemas enjoy public support and funding. The City Council Tuesday night voted unanimously to give $75,000 to a nonprofit organization that runs a movie theater in downtown Iowa City. 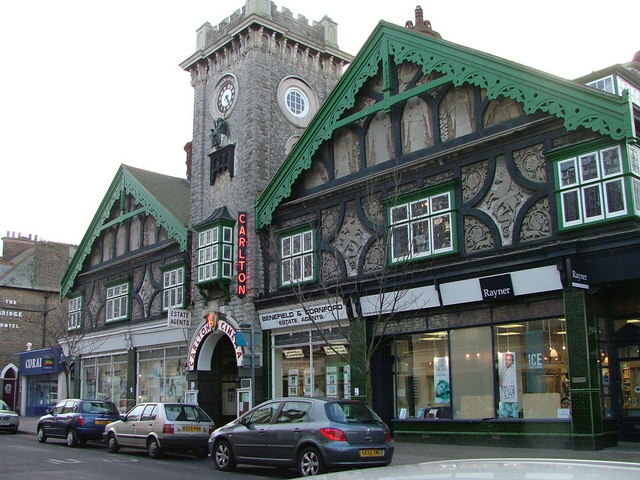 In The Guardian’s on-going Cine-files series, the turn has come to the Carlton Cinema in Westgate-on-Sea.